This festival wedding at the wonderful Lains Barn in Oxfordshire reminds us why we LOVE autumn weddings. The sunshine on Stacey and Roger's day was just so gloriously golden, giving a romantic softness to their photographs. If the crispy leaves weren't enough to make us fall in love, the giant pies and chefs hats certainly did it! Lains Barn made the perfect backdrop for a festival themed day, from the outdoor acoustic set in the stableyard, to The Vents raising the rafters in the barn later on. We loved the little touches, such as record disk table names, to really set off the theme. "I started at home with Stacey and her sisters for their final preparations. Stacey’s sisters did her make-up and helped her get dressed, but there was still time for some champagne! It was a relaxed atmosphere with plenty of laughter. I then headed over to the Lains Barn wedding venue to meet Roger and the groomsmen. We had a few relaxed photos in the grounds before they went off to look after the guests, and I awaited Stacey’s arrival. To say the bride looked stunning is an under-statement! The ceremony was relaxed and fun, which is very fitting for an informal wedding venue such as Lains Barn. With its rustic setting and lovely touches its one of my favourite locations. After the ceremony we had a line of confetti to welcome the newlyweds followed by drinks and canapes. We were so lucky with the gorgeous Autumn sunshine. Stacey and Roger had a few photos in the grounds and it was then time for the wedding breakfast. The chefs on each table all did a marvellous job! We then cut the cake and The Vents entertained the crowd with their fabulous music." 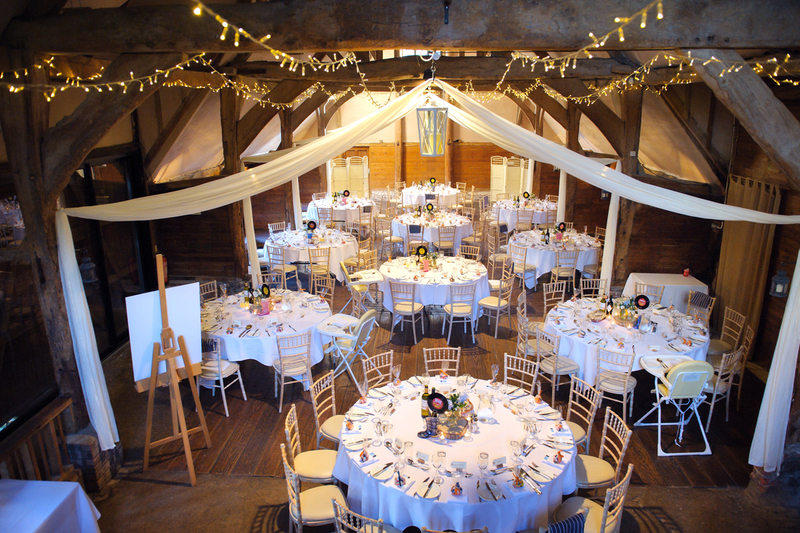 If you'd like to contact the team at Lains Barn to discuss your own wedding, you can do so here. For more wedding venues in Oxfordshire please click here.